While I tend to favor interrupt drive or callbacks, both are possible in BASIC. One user seemed determine to get multitasking into the BASIC. After some thinking on my part, I could see interrupts could be used to switch between tasks. So I took a look at a simple example. Using timer interrupts and separate stacks for each task, it is possible to time share them. These tasks are ones that never end. For tasks that do end, they can still be driven by interrupts and will have a higher priority if only because the time shared tasks are not blocking interrupts. This was a first, I posted a blog entry before the forum entry. Usually deeper details will be at the forum, and discussion can happen here with users. The blog is driven by markdown, so I can post user comments to the blog, if they are in markdown. 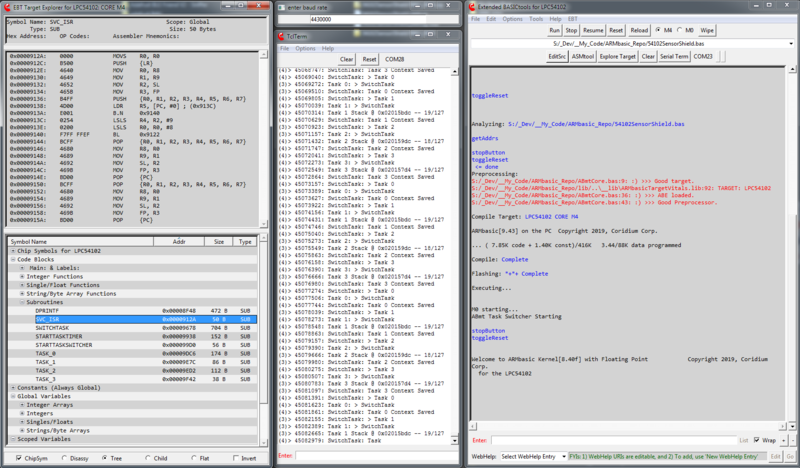 This task switch was done with 4 lines of inline assembly, needed to copy the SP or to set the SP to the new context.
' if we do finish early someday -- a software interrupt could be used ??? This was the first pass, waiting to get feedback. The task0 could be setup to use the main stack, eliminating stack0, and by disabling the timer, it could return to the main: or wherever it was called from. Not sure this is a real necessary improvement, but could be done. For simplicity push ASM instructions would be needed. Did you play around with this idea any further, Basicchip? Sir B has been very helpful in assisting me/us with implementing a working solution. After a couple of iterations of context switch code massages, it seems to be quite stable. I'm working on a couple of projects that will lean on what I am coining as ABmt (ArmBasic MultiTasking). A pendant controller (think VR Headset Control) for a small boat's trolling motor. ABmt is what I perceive as a natural progression of the initial implementation that enables task addition with low-effort compile-time self-configuration/ingestion of task code, etc. It is a precursor to a proper implementation of an RTOS, ABrtos (a.k.a. Project Storm), where a formal scheduler will be implemented to enable proper run-time task sequencing/scheduling via some form of structured approach (rate monotonic, preemptive, cooperative, ...). ABmt implements a fixed hybrid form of Cooperative/Preemptive, where tasks yield their time slice when they haven't anything to accomplish during the current pass, with unilateral/preemptive task switching in the event a task doesn't yield prior to its time slice being consumed. There is a dprintf debug serial stream that is bitbanged and is able to emit info at some 4.4Mbps via a gpio on a Coridium 54102 target (bit banged to mitigate impact of interrupts inside an ISR). The emissions in the image are highly verbose, just for testing/dev purposes. The UI that you're seeing in the image is a project I've been working on, with help from BasicChip and Olzeke51. As a small bit of a spoiler alert, this will be a topic of a blog post where it is formally introduced, with links to an introductory video(s), and instantiation of a thread herein to offer it up to the user community. I've gotta run for the day job. Take care and have a great day.